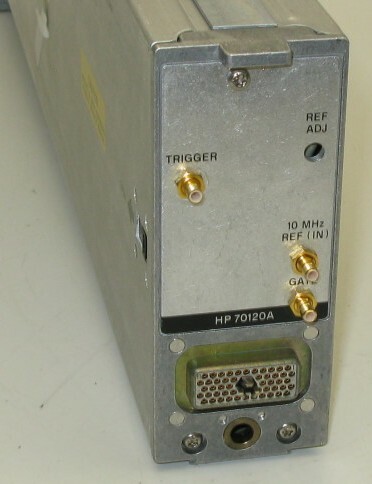 The single-slot Agilent 70120A provides three channels: 100 MHz, 200 MHz (1/2), and 2.4 GHz (1/64). Each of the inputs may be switched between 1 M ohms or 50 ohms. 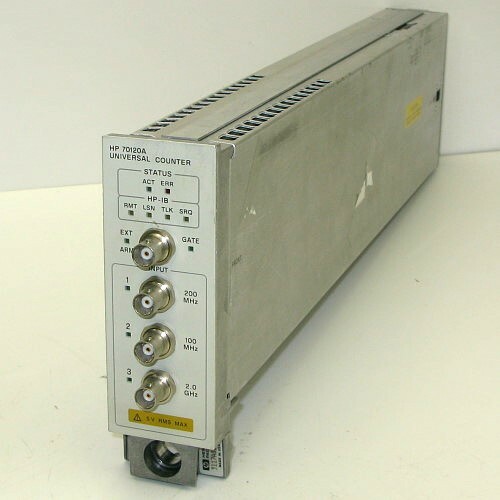 Sensitivity is 100 mV peak-to-peak, and for larger signals, an internal x 10 attenuator allows measurements up to ±100 V peak. Built-in functions include frequency, period, time interval, rise and fall times, ratios, totalize, pulse width, and voltage minimum and maximum for ac or dc. The 10 MHz reference gives the user the option of locking to a house standard or remotely switching in the internal TCXO.